05:16 <testor> so anyone still awake? 05:33 <testor> so how skilled are you with mythtv? 05:34 <blinx> on a scale from -38 to +16.3? 05:34 <blinx> I have used it for about a month I guess..
05:40 <testor> that might be why your in here? 05:40 <blinx> I broke some qt stuff. 05:40 <blinx> sometimes I should learn not to use the latest cvs version of everything..
05:41 <blinx> brb.. fetching some coffee. 11:27 <mdz> is there any way to suppress channels without having tv_grab_* come up and scream about it every time they start up? 11:29 <Chutt> scream about it? 11:29 <Chutt> did you delete the line or comment it out? 11:37 <mdz> does your company have something similar which works? 11:37 <mdz> is it open? 11:39 <mdz> problem with the name? 11:40 <Chutt> remember the 'amp' mp3 player? 11:40 <Chutt> and the company that got a bunch of cash outta winamp? 11:40 <mdz> how did they make money on winamp? do people buy it? 11:41 <mdz> I read that as "got a bunch of cash [profit] outta winamp"
11:45 <Namapoos> Chutt, why don't you try to make money off mythtv? 11:53 <mdz> ed to eat your email, and humbly ask that you let them turn off this feature they don't like. 11:54 <mdz> and one for "disable crappy picture quality"
11:56 <mdz> "DP: Don't strip directorys, goddamn!" 12:04 <Chutt> how large is the .deb, btw? 12:08 <mdz> why this -mt business anyway? why does it need a separate library for threaded apps? 12:09 <mdz> oh, upstream just ships one lib? 12:11 <mdz> it will actually link? 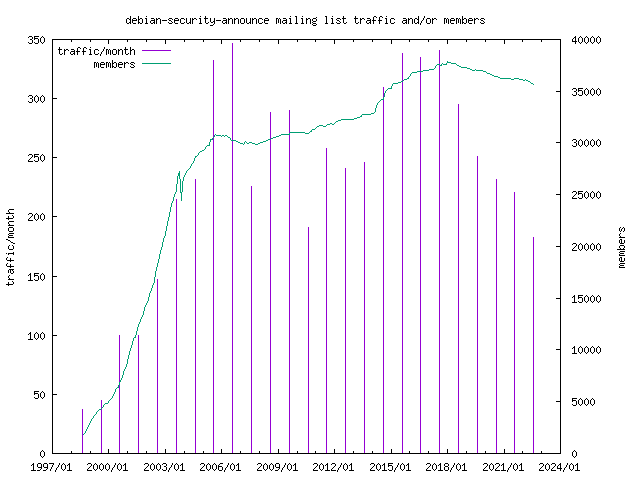 12:23 <mdz> is it just me or has mailing list traffic picked up a lot? 12:35 <Namapoos> Chutt, are you still in school? or do you have a job? 12:39 <mdz> "I never needed an interrupt for a video card before"
12:41 <mdz> doesn't int 10 count? 12:42 <Chutt> you can usually turn off the interrupt for the video card in the bios, no? 12:44 <mdz> but it order to do anything other than write to video memory, an interrupt should be necessary somewhere, no? 12:52 <mdz> why, is exodus closing up shop? 12:55 <mdz> how many were there 6 months ago? 12:57 <mdz> 0.6 was in october, no? 13:14 <mdz> how long was it broken? 13:34 <Universe> so you have to editing all in? 20:02 <kaveh420> am i supposed to put the line out of the tv card into the line in of the audio card and then the line out of the audio card goes to speakers? 20:02 <kaveh420> can anyone help? 20:22 <s3fudi> hey what do you guys think is a better card, the pinnacle pctv or a hauppage wintv pci ? 21:27 <brtb> i assume you have the modules loaded for your soundcard? 21:27 <rob> does dsp need to be ln'd to something? 21:28 <rob> brtb: so anything in particular I need to get doin? 21:47 <rob> so if oss audio works, should /dev/dsp work as well? 23:06 <rob> heya chutt, you home?